The NRA's Personal Protection in the Home course contains all of the required content to meet Michigan State Firearm Law for applying for a CPL. As part of our class, we also present the NRA's Basic Pistol course, which is a pre-requisite to Personal Protection in the Home. Basic Pistol serves as a good review of information for experienced shooters, and is a great foundation to build firearm knowledge for new shooters. Basic Pistol in now available in a "blended" format, as well as the traditional "instructor led" format. Unless stated differently, all classes will be "instructor led". In this format, we present the entire class. There is no "online" portion that is required, prior to attending. Most of our classes are the "Instructor Led Format." Meaning that we present the material directly to you. You are not required to take any additional (i.e. online) training prior to coming to us. Our Personal Protection in the Home course, when combined with Basic Pistol, is approximately 15-16hrs, over 2 days. This goes above and beyond Michigan's training requirements to apply for a CPL. This format includes the State requirement of 3hrs (minimum) instruction on the firing range. Total class time may vary based on class size, weather, other factors, etc. ALL State Requirements will be met. Day 2 - Sunday 1pm-4pm (minimum). Class size, date, or other factors may require modifying the class times. 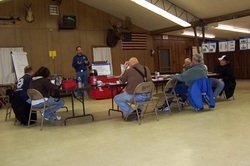 The blended format for NRA's Basic Pistol Course consists of 2 parts, Phase 1 and Phase 2. Phase 1 is completed online. Phase 2 is taught in the classroom, and includes live fire on the range. Personal Protection in the Home would still be in the traditional Instructor Led Format. Please see our Frequently Asked Question - FAQ's or contact us for more details. Please note: if what you are looking for is a bare-bones, minimal effort class to get your CPL, the easiest way you can... we are not for you. But if you want a comprehensive training experience*, that focuses on Safety, Knowledge, Skills, and Attitude, we would love to work with you! *Compare our class with others to see for yourself. All students will complete both Basic Pistol and Personal Protection in The Home, as well as receive certificates of completion for each discipline. Lunch and some light snacks are provided for Day 1 of class. Total cost is $130 per person. We pride ourselves on working with shooters of all skill levels. Everyone (law-abiding person) has the right of self-defense, we want to make sure that you can exercise that right while keeping yourself and your family safe at the same time. Pre-registration is required. Please contact us to reserve your seat. A GOOD attitude toward SAFETY! This is the most important aspect of shooting safely! Your personal (defense) handgun. If you don't have your own, please contact us to arrange the use of one. 150 rounds (minimum) of standard velocity factory loaded target ammunition. No +P, +P+, magnum, handloads or reloads allowed. Do not bring firearms or ammunition to class for Day 1. Specific directions will be given for how/when to bring these in for day 2. Please Note - ​Cash, Personal Checks or Money Orders are always accepted. ​No Credit Cards. Sorry for any inconvenience! ​More class dates coming soon!